Tom Holland just debuted his version of Spider-Man in Captain America: Civil War and prior to actually seeing the film, many fans were starting to feel some fatigue with two reboots of the franchise taking place very near one another. Though Tobey Maguire and Andrew Garfield both had their strong points, the consensus now seems to be that Holland is the best version of this character we've seen in a live action adaptation to date. His first solo movie included in the Marvel Cinematic Universe, Spider-Man: Homecoming, is gearing up for production, and the rumors are starting to fly. Be warned, this article may contain information that could be viewed as spoilers, so be warned. A recent report by JoBlo claims to have a lot of new information about the villains in the film and how they tie into the larger scope of the MCU. As has been rumored for quite some time, the report claims that Adrian Toomes aka The Vulture will indeed be in Spiderman: Homecoming. This rumor has been persisting for quite some time and as of now, it looks like Oscar nominee Michael Keaton will be playing him, if all goes well. The report confidently proclaims that Vulture will be a main fixture in the film, as he will be the big bad villain. "We can confirm that not only is The Vulture in the film, but he is, in fact, the main villain. But, he's not the only bad guy in the mix." As for the other villain that the report references? It looks like The Tinkerer will be making an appearance as well, and will not just be a throw away, but will actually tie heavily into the plot. The Tinkerer is a genius level engineer who can create and invent complex and sophisticated gadgets from spare parts and leftovers. The rumor states that The Tinkerer will be building Vulture's suit from spare parts that were found in the wreckage of the Chitauri invasion of New York City, which of course took place in The Avengers. If this turns out to to be true, it will be a very clever and organic way of being able to tie in the greater events of the MCU with Spider-Man: Homecoming. Those who have seen Captain America: Civil War (and if the box office is to be believed, that is pretty much everyone at this point) know that the Spider-Man suit primarily featured in the film was made for Parker by Tony Stark, and it looks like that may not be where it ends. We already know that Robert Downey Jr. has signed on to appear in Spider-Man: Homecoming, and rumor has it he will be making even more upgrades for Spidey. In the post credit scene for Civil War, Parker discovers that the web shooters Stark designed for him also feature his classic signal light, which was another very classic reference to the character's lore from the comics. But this new report claims that the Stan Lee and Steve Ditko influence on the new Spider-Man costume won't stop there, as Stark supposedly has some more upgrades in mind. "It looks like we'll be seeing more old-school signature Spidey features, as Stark will also be supplying the classic Web Wings from the comics that will be able to deploy as needed." This is all far from confirmed and should be taken with a relative grain of salt. That being said, the character selections and details do make a lot of sense in terms of plot points tying into one another and fitting into the greater scope of the MCU. Also, this would seem to fit with Stark taking on the role as more of a mentor for Spider-Man in the films, as opposed to just having Iron Man show up and blast Vulture right out of the skyline. 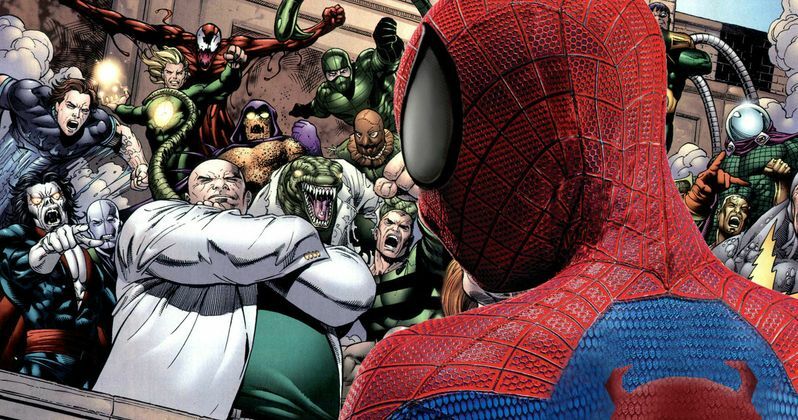 Rumors seem to be coming out a mile a minute as production nears on the film, as it was recently rumored that Vincent D'Onofrio will be reprising his role as Kingpin in Spider-man: Homecoming from the Netflix Daredevil series, which will be a big deal as it will be the first time a character from the TV side of the MCU has been brought into the film side. Things will likely firm up in the very near future, with the film set for a release on July 7 of next year, production will begin very soon and solid details will be pouring out once filming starts. Spider-Man: Homecoming is being directed by Jon Watts with a script by John Francis Daley and Jonathan M. Goldstein. Tom Holland and Marisa Tomei will be reprising their roles as Peter Parker and Aunt May respectively and will be joined by Robert Downey Jr. as Tony Stark and Zendaya as a character simply known as Michelle at this point. Be sure to stay tuned for more information as the story develops.